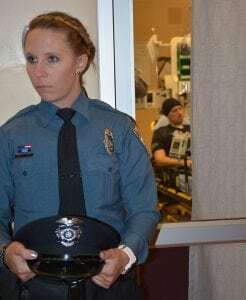 Surrounded by more than 150 of his brothers and sisters in blue, Colorado Springs Police Officer Cem Duzel was transferred Tuesday morning from UCHealth Memorial Hospital Central to Craig Hospital in Englewood. 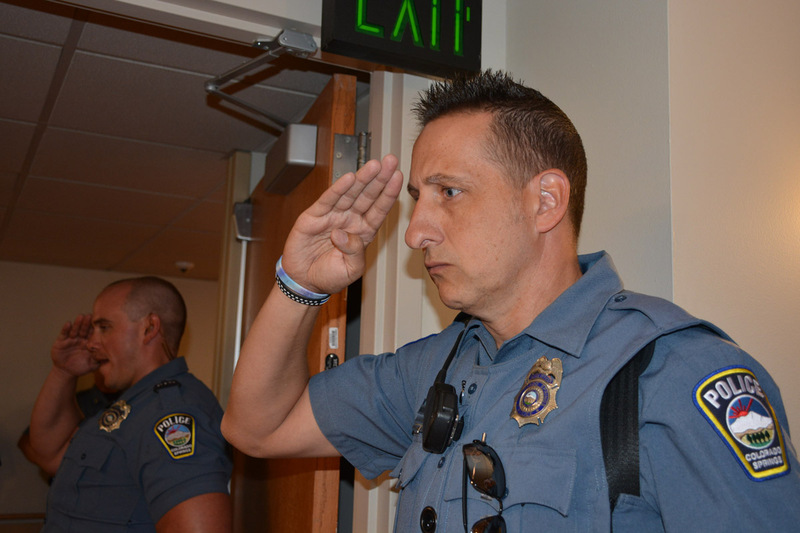 An officer stands outside a room where CSPD Officer Duzel received care at UCHealth Memorial Hospital Central in Colorado Springs. Officer Duzel was shot Aug. 2 while responding to a report of shots fired, only a few blocks from the hospital. 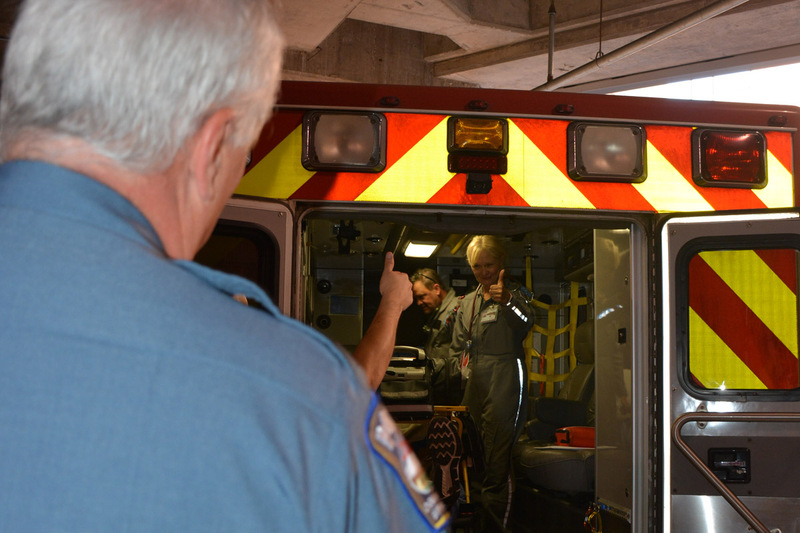 He has been cared for by UCHealth doctors, nurses, techs and other medical professionals since he was injured. 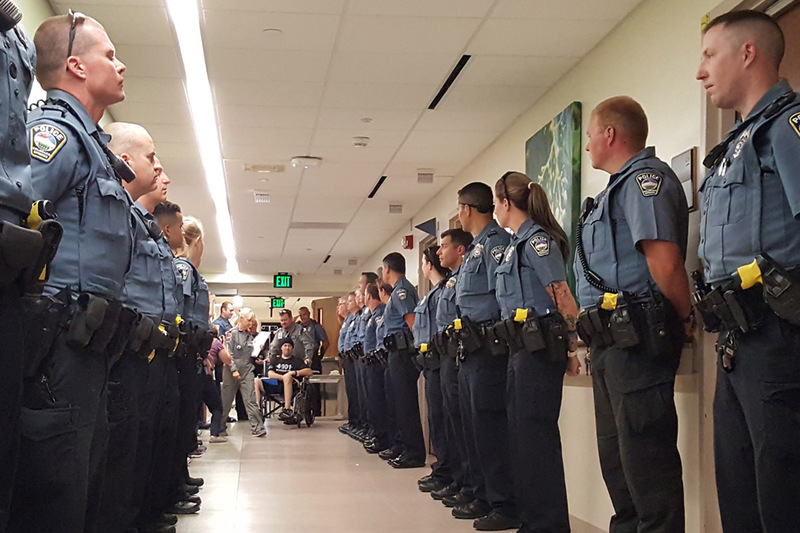 Police officers, standing elbow to elbow with UCHealth caregivers, lined the hallways of Memorial and saluted Officer Duzel as his wheelchair passed. Duzel wiped tears from his eyes, visibly moved by their show of friendship and support. 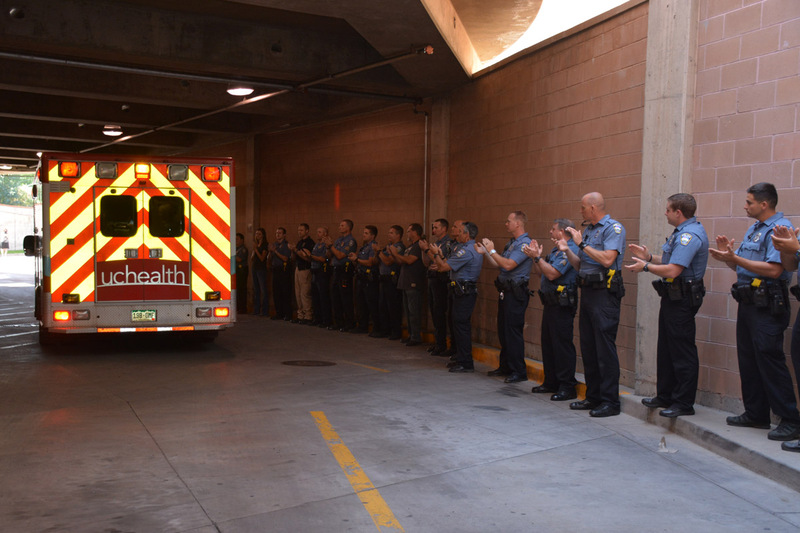 When Officer Duzel moved into the ambulance bay outside the emergency department, police officers and caregivers erupted in applause, providing a warm, heartfelt send-off to Duzel, who traveled by UCHealth LifeLine’s critical care ambulance to metro Denver. Colorado Springs Mayor John Suthers joined Colorado Springs Police Chief Pete Carey and the officers in honoring Duzel, who has served with the police department for five years. “We are honored to have cared for Officer Duzel and his family, and he and the Colorado Springs Police Department will remain in our thoughts as Officer Duzel begins the next chapter in his healing process,’’ said Joel Yuhas, President and CEO of UCHealth Memorial Hospital.